I (David) was recently reflecting on the sufficiency of Scripture and there are two verses that really had an impact on how I view the Bible and why it matters so much to me. Deuteronomy 32:47 NIV – They are not just idle words for you – they are your life. By them you will live long in the land you are crossing the Jordan to possess. Do I still look to the WORD for life? It is easy to get discouraged when things don’t seem to be going well. (Like when your support level has plateaued and it doesn’t seem like the next step is known) But God is still the ROCK, he is my ROCK. He is faithful and all he does is upright and just. When things don’t go the way I planned or hoped why do I get angry and blame God? He is good all the time. Oh that I would have eyes and a heart to continually read His Words, because they are not just idle words but they are my life. Psalm 119:97 NIV – Oh, how I love your law! I meditate on it all day long. 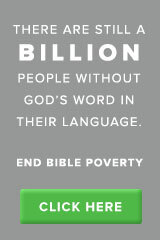 #WhyBible, because there is no other way! What s great reminder. The situation may not be our desired choice, but God is good, and what He has in store for us is best!